I think most people have heard of, if not seen, The Walking Dead by now. This show has everyone thinking about what they would do if a zombie apocalypse happened. Some people prep and plan for the unknown. Now, I don’t watch the show, but I’ve been told there was a character who was a veterinarian. Then I started thinking, well, what could be better than having a vet on your side?! Here are 5 reasons why you should want a veterinarian on your side in a zombie apocalypse. 1. They can avoid bites. As I understand it, zombies infect healthy people by biting them. In the veterinarian world, we dodge bites multiple times a day. We know when that adorable little fluff ball of a kitten is going to turn in to Scar from The Lion King. We can retract our limbs in seconds to avoid the jaws of a snappy chihuahua. Avoiding bites is part of the job. 2. They are trained in all species. That means that, next to a human physician, vets are your best option for medical help. The anatomy just needs to be slightly shifted. If you can find a vet that specializes in primates, all the better! 3. They are not afraid of getting dirty. Vets are frequently elbow deep in all kinds of things that you don’t even want to know about. It seems to me that this could be very helpful when there’s no time to be squeamish and things just need to get done! 4. They don’t take breaks. Seriously. They work until everything is done! Vets are used to going hours without a lunch or bathroom break. And when they do finally take a break, they are usually multitasking and working on their medical records. 5. They can take care of the animals. With limited resources, it would be imperative to keep livestock a live for food, dogs for security, horses for transportation, and cats for entertainment (What? Did you think cats were suddenly going to be helpful and start earning their keep?). Who better than a vet to take care of them all? 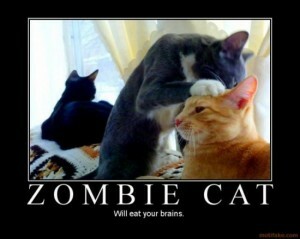 So, have you prepared your zombie apocalypse plan? Who would you want on your team? Let us know on our Facebook page!